Saturday came by again, way too quickly. It felt like yesterday when of course it was seven days ago. Short weeks at work mess things up a bit like that. Add a day off for my birthday and it was a very short week; just three days. As it was we’d been invited to two parties, the first of which was on Saturday. We arrived at the party venue to find another couple waiting outside, the venue deserted. Fortunately I had my invite and we got in touch with the hosts – it had been cancelled, and we were the two who didn’t get told. It was okay though, the sun was shining, the park was nearby and all the drain channels are still overflowed so Carshalton still has it’s mini water features that haven’t been seen for years. 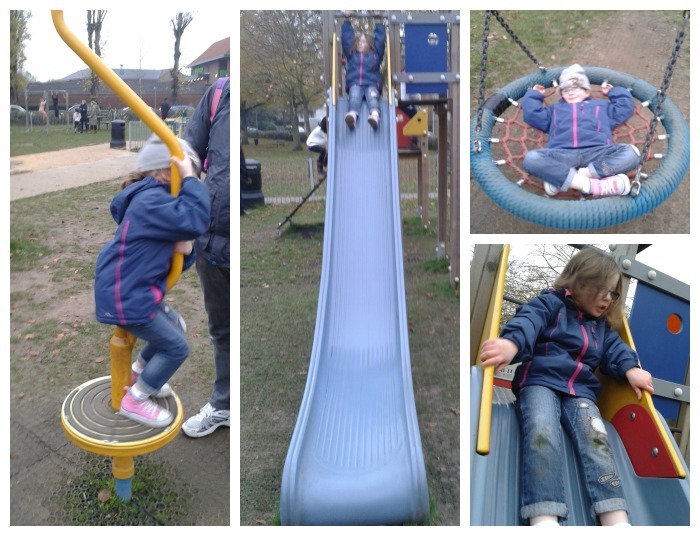 So we headed to Carshalton Park, and the play area there. Beka was there too with her girls, H and M hit it off straight away, playing together and plans were made for future meet ups. H continued to play and Jo from work appeared with her boyfriend, so we all had a little chat while H got over her shyness. The thing I like about bumping into people I know is that you find out things you never knew existed – for example, a lot of the trees in Carshalton Park have little doors on them. Apparently, the not-so-nice story is due to arsonists the trees had to be protected as they’re hollow inside so doors were put on them, but for a four year old they’re the front door to a tree troll’s house, which H was a little troubled about, but still knocked on there. At the top of the hill you can look down into Carshalton – and see all the way to The Shard, or Crystal Palace in the other direction. It was the perfect weather for views and play and discovering things, I do like it when that happens. It’s been a busy few weeks, with holidays and a hectic social life to keep up with which quite frankly is affecting my blog time and I’m lagging behind in several things, Country Kids being one of them. 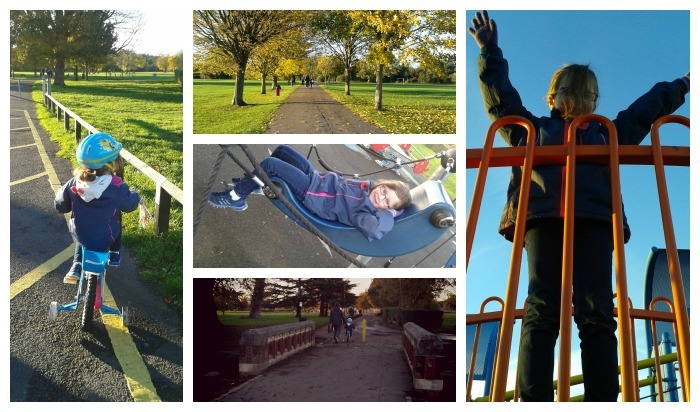 We live in the city, but there’s still plenty of parks around – we’ve visited three these last two weeks. So here’s a little roundup. After BlogFest last Saturday I HAD to get outside and enjoy some fresh air but not go too far. We decided on Beddington Park as it’s up the road and there’s a good cycle track. One thing I’ve noticed is how much H reminds me when cycling of my mum when she was learning to drive – she’s not looking at the path/road ahead and is watching everyone else instead… There’s a good track around the park so we went on foot while H cycled (then declared she was ‘too tired’ and wanted to walk) before heading to the play area for some much needed climbing. We bumped into friends there and ended up in the Pavilion Cafe (who have some lovely olive oil for sale there – I shall be going back). What struck me the most was how Autumn really is here – the park is no longer green, it’s golden and brown, leaves everywhere. Everyone was out but it wasn’t the friendly kind of out you’d get doing some country rambling – people in London still minding their own business. Yesterday was an average kind of Saturday, nothing special other than I was T I R E D. The second of my nights out had passed, The Fall played at the Clapham Grand, the easiest gig I’ve got to and from in a long time – I was out for no more than two hours, and they weren’t on stage until 10. 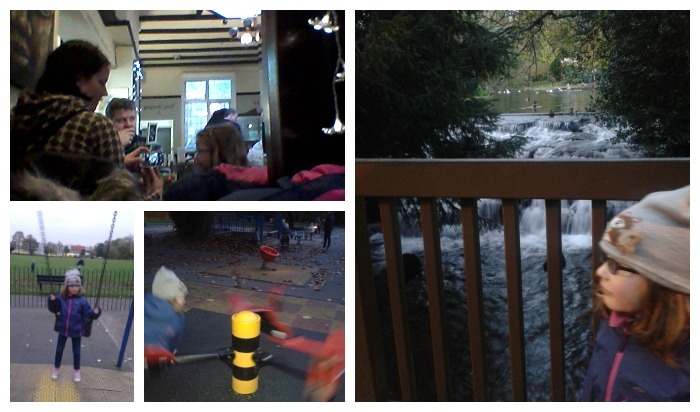 We decided we’d go for a late lunch in our local excellent pub The Sun, then headed through The Grove via the ducks and the waterfall to the play area, having a good try on everything before it got dark. H showed Shaun her new skills going down a fireman’s pole (kicking him in the face by accident) and there’s no stopping her now. She was once the little one in the playground and now she’s the confident older kid. She goes on the frames I was scared her being on and does it without a problem. She’s been shown how to slide down a pole at school by her TA and now does it with confidence in the park. She’s also tall enough to start herself off on the swings – something she couldn’t do last month, so I’m going to pretend all that eating last month was another growth spurt. After that we headed into Carshalton and popped into the wonderful Calladoodles shop, where I picked up birthday presents for mid-December as we’ve got two parties coming. They’ve got some Calladoodles own wrapping paper in there soon which sounds like it’s going to be gorgeous. I could spend TOO much money in there. There was no time to head back to the park and it was too dark, so we promised H she could go to another park today (Sunday). After realising we can’t wait until the delivery on Tuesday, it was decided we’d head to Banstead and I’d nip into Waitrose while Shaun and H went to the park there (and I could claim my free coffee). By the time I’d met them she’d fallen off a few things and was getting angry but determined. By the time we left she was in tears of frustration at a climbing net on a frame which she can climb up but not confidently enough to do it without us hovering around her (it’s quite a big gap and she didn’t want to climb across it, just up it). We knew it was time to head home when the tears arrived, and besides, we had two films to watch for Movie Night. So we’ve been outside. We need to spend more time out there, but what we’ve done is fine for now. Today in the car H announced “I need to stop soon. 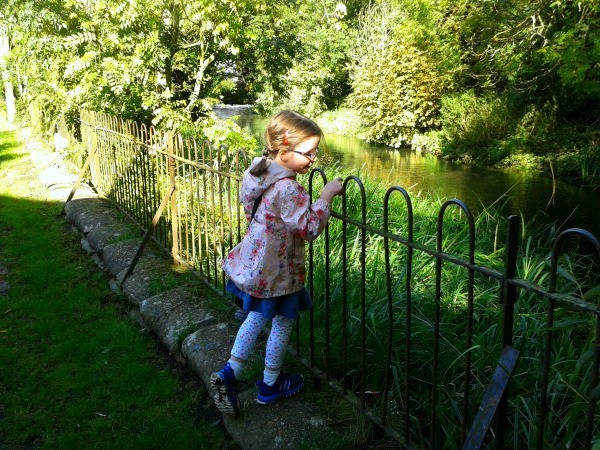 I want some fresh air and to run around on the grass and stretch my legs” – impressive considering she’s only four. She gets it, we all get it. Get outside. 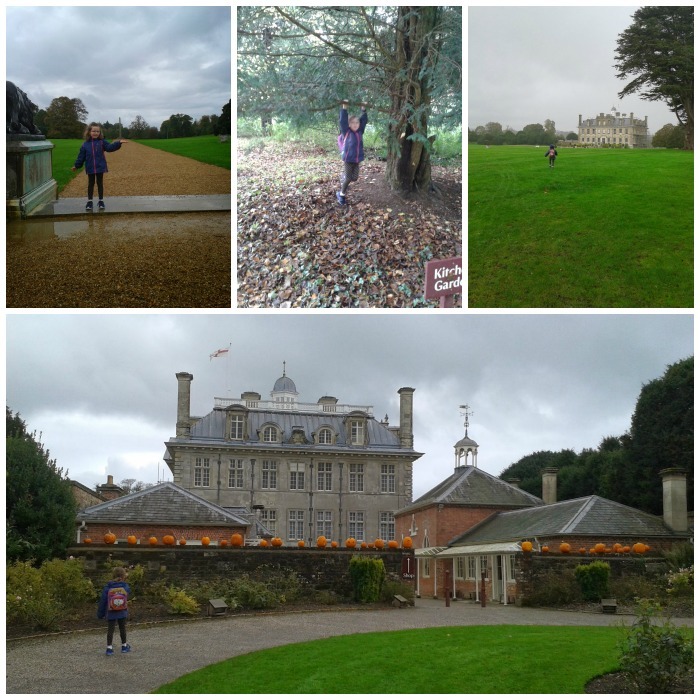 Fortunately we were heading for Kingston Lacy, a National Trust place on our way home from Weymouth. So we stopped. It rained. She ran around in the rain, and didn’t stop running. In fact, by the time we got home her feet were soaked – she’d mentioned it earlier but hadn’t reminded us. Parent fail. 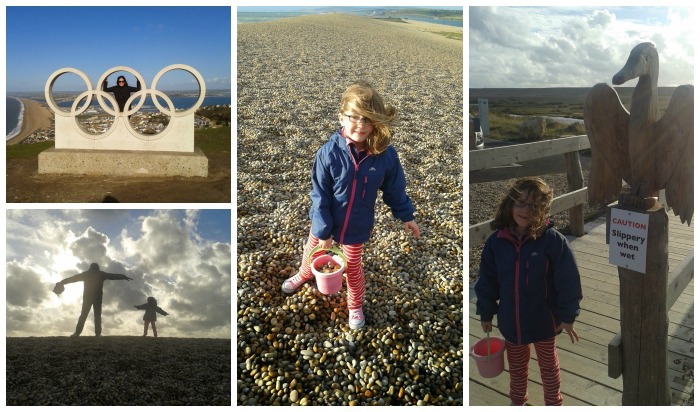 But she had a brilliant time – we had a brilliant week away. I might have been ill but it was nice to get out of London and breathe again. So here’s a few snapshots of our week. I already miss the fresh air terribly. 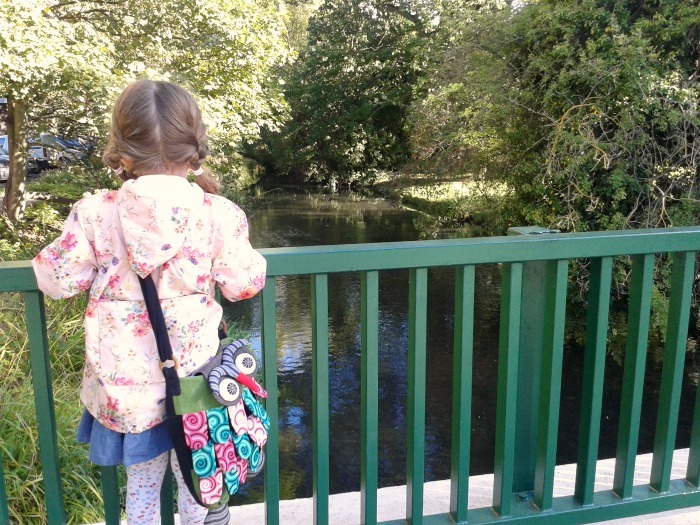 We walked along the River Wandle to The Fabric Warehouse in Hackbridge. A nice little walk along the river, quiet and a lovely bright day, not especially warm but good crisp autumn weather. Making the most of a bright Monday before it gets too wet and cold. 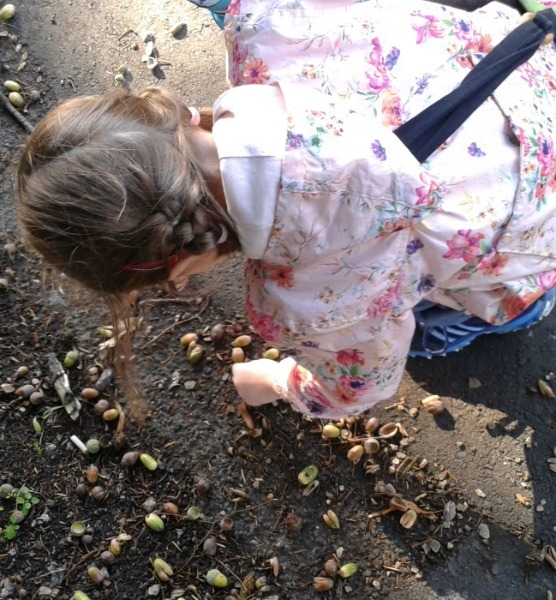 We went in hunt of ducks to say hello to, brambles to take photos of and conkers to identify the tree they come from. We got back home with just an acorn. “The ducks must have been swimming underwater because they’re tired”, H decided. She didn’t mind. The acorn had a hat on anyway. We both giggled as we’ve found more brambles for daddy for next weekend, which means more pie! H’s language is great. Her grasp of everyday english surprises me daily – she’ll hold an absolutely fine conversation with anyone and have plenty to say, so we’re starting to work on words she doesn’t quite get right, teaching her the correct pronounciation while mourning the last weeks of baby-talk. Recently she will say something which isn’t exactly grammatically correct but does still mean the same thing. I need proper examples and I don’t have them. There’s the four-year old imagination going on which quite frankly is an odd imagination (but one I like), and the one which likes to pick a fight, or just refuse to do anything. Actually, the refusal to do anything is kind of funny. 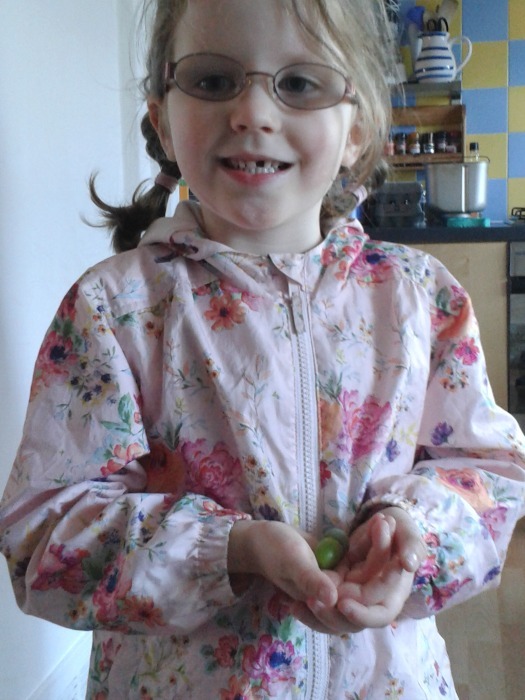 Earlier today she was about to tidy up her toys, so I offered her 5p for her money-box as it’s a task around the house. “That’s boring!” she replied. Yes, she is now bored with getting pocket-money. We’ll see how long that one lasts. 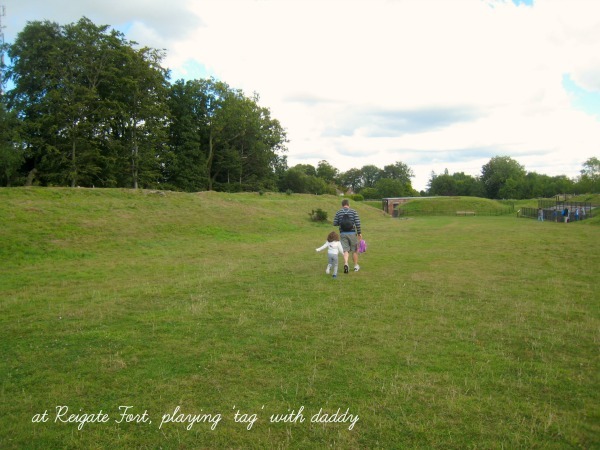 We went up to Reigate Fort for a walk and to get some fresh air, where she then point-blank refused to do most things. “Oh, look at the lovely view!” we’d say, and she’d turn, face her back to the lovely view and tell us she doesn’t want to look at it. Fortunately this is still remedied by telling her not to look at the lovely view, which results in her turning round and looking at it to defy us. Again. It’s getting tiring, and I would think probably isn’t about to change for the next twelve years, right? She’s inherited some of me, well, a lot of me. I can see it, I talk to it and hear a mini-me talking back. We pull faces and they’re the same and we laugh at how similar we seem. It’s strange. My little girl is so much more aware of herself than the little girl of a year ago. I’ll say something and she’ll correct me, “no mummy, I am in fact this” and tell me. She tells me exactly what she is. She tells me exactly what everything is. Me, meanwhile, I barely remember what things are any more. I talk about menus when I mean calendars, I talk about radiators when I mean refrigerators, and I can’t remember names. Fortunately Mini-Me is around to help; she knows too many words. I started a Mum Friendly Tumblr page today. See, I got thinking – I’ve reviewed a lot of things on here and mentioned them, but surely there’s no better advert – advert is completely the wrong word. I babble on to friends about products I really like, so instead I’ll use example – than seeing it in use? Can you make Tumblr groups, so people who might be doing a similar thing can cross-pollinate their finds? 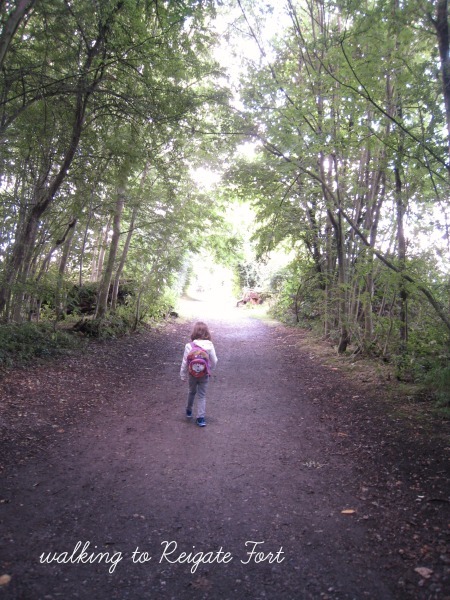 We recently received a Little Life Voyager S2 toddler backpack – and although we’ve no plans to go anywhere this weekend (next weekend maybe…) we decided to put it to the test in our back yard, try H in it and see what she thought of it. 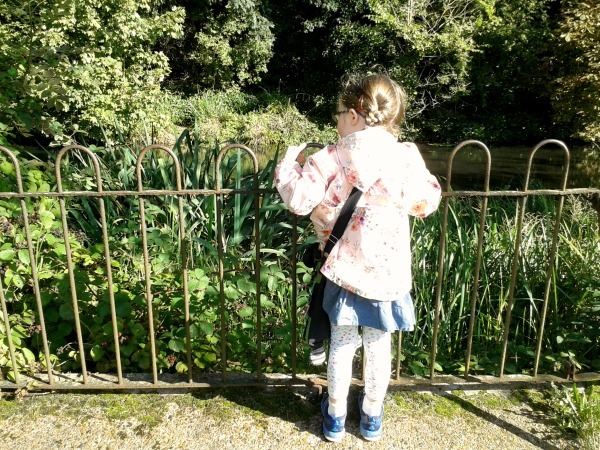 Generally when we’ve gone out (usually to National Trust places) we’ll take a buggy and push it along – she’ll often get tired and want to be picked up, or can be persuaded to go into her buggy for some drinks and snacks. I feel like we’ve probably got this a year too late as well – this would have been good for some of the places we’ve been to. We’re both tall, and neither of us felt like H was sticking up a lot further than we were. One thing that got us both was having to make sure we had it fastened to us nice and securely was not at all flattering for the waistline… at all! Having said that, it’s practical, there’s a compartment in the back complete with sun shade and rain cover, there’s a couple of foot straps (H didn’t like that despite us trying to convince her it’s like ‘Horsey Horsey’) and actually, despite being a tall girl, she fits in there comfortably (and the rain cover does cover her up). I do wonder if this is the kind of thing which people can use on their own though – I’d need a second person to get the backpack on my back!